Black Feather Rising has its origins (as I remember) in a musical concept that had no need of a libretto. It began life as a possible commission from Godelieve Schrama for a virtuoso work for solo harp. But in Param Vir’s inner hearing this soon began to attract to itself the sound of a female voice. So my first sense of the project, as he proposed it to me, was of a 30-35 minute scena for soprano and harp: nothing dramatic as such; rather, a tableau. I’ll confess that I was mildly interested in that, but only mildly. I had collaborated with Param Vir nearly 20 years previously, on a one-act music-theatre piece for the Munich Biennale. For us both, this collaboration had proved an exacting process – not only because of the dramaturgical difficulties inherent in the narrative we had chosen (essentially a contest between two instrumentalists), but also because of the creative and self-critical demands we were making of each other. The libretto painfully evolved over a three-year period, undergoing seven comprehensive reworkings, each reworking itself several times revised. Yet the final version is in essence already visible in my first draft. And the work that we thus generated, Broken Strings, proved (I can honestly say) beautiful and masterly in performance on the space – and, more to the point, effortless-seeming and spontaneous: as though it had come naturally right first time. Which I think is how it should be. 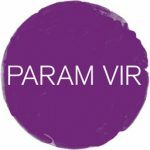 For all that, when Param Vir suggested, in 2006, this further collaboration, I was reluctant. We had for years been endeavouring to develop a larger music-theatre project, and to secure backing for it, and had not succeeded; and after working five libretti for it, I was quite discouraged. But my reluctance lay deeper – in my decision, personal and private to me at that time, to abandon theatre for a more intimate genre. I had in fact already begun work on a stage-play that was telling me it would be my last. I consented to this new collaboration only because I understood it to be a non-dramatic work. 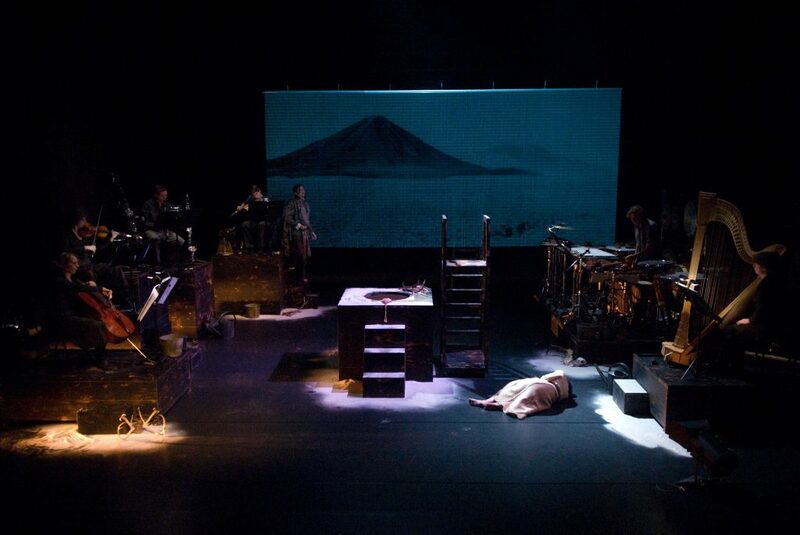 So I began to explore possible material for this scena, and into focus came (as with Broken Strings) some Buddhist legends and parables – particularly one that tells of a young woman struggling through a storm-lashed forest, a traumatic journey at the end of which she has lost husband, child, parents . . . The moral is that she will have to learn to shed her need for all she has lost, and transmute that loss into a new freedom and serenity. But for one solo character to discover this necessity for self-transformation, and express it, she must consciously set out a new ideology for herself; and, however truthfully I negotiate that, the piece will become didactic. Such transformation needs to be achieved, in drama at least, by interaction. This would call for a second character. Already the scena concept had begun to feel inadequate to me. And I was fearing monotony: over one entire narrative curve, the timbre – however ingeniously varied – of one voice and harp. In practice, I was beginning to ‘hear’ a masculine voice as well. One obvious solution is to have our grief-stricken woman encounter a healer figure who can begin to educate her toward the transformation that she needs. But such a character can only preach to her, however gently or unrhetorically he does so; he himself is static, and has no vitality upon the space – unless he too has what actors call a learning process, a ‘journey’ of his own to make. So I abandoned the healer figure, and into the material I tried to graft instead a totally opposite sort of character – a male survivor from a village massacre in a tribal war. Perhaps by interaction he and this afflicted woman could mutually transmute her grief, his anger . . . I developed, and offered, a synopsis to this effect. The original harp commission was thus growing to a music-theatre piece, and it was because of this development that Stichting Octopus became involved. And here was a story-concept with an added advantage: into an ancient alien legend, the motif of village massacre, tribal war, brought a modern familiar resonance. But, unkindly of me, I was already becoming discontent with this story too. I did not believe that these two characters could truly transmute such powerful negative emotions in each other within the single time-span of this piece – even at a length increased to a long ‘hour’. And one single time-span it had to be: it was a harnessing, disciplining factor, and from the beginning had been the only aspect that remained unchanged. “Wind That Grows (her name in the story) is making her difficult dangerous way through hostile forest and up hills of sharp rock. In a pouch she carries four human teeth, all that physically remain of the man she loves. She is going in search of her aunt who alone has the magic to conjure from the teeth the man himself, restored to physical wholeness again. But she finds her aunt’s house fallen, and the aunt herself nowhere. Wind That Grows must continue her quest alone – with only her instincts, and the elements, to guide her. As she picks her perilous way down a sheer rock face, the precious pouch hung by a string about her neck, a mud swallow starts up, snatches the pouch and bears it away. All purpose to her journey lost, the girl abandons hope, lets go, and falls to the rock floor of the valley below. “The mud swallow is a bird-incarnation of Healing Woman, who now re-materialises, and does what the girl had hoped the aunt would do: she conjures from the teeth the man himself, restored. His name is Raven Caller, and she tells him of the young woman who came in search of him: thanks to her love and her courageous search, he has his life again; now he must go to where Wind That Grows lies fallen, and restore her in turn. But for some reason we do not yet know, he cannot. The most he can do, for now, is call on the ravens to do his bidding, to come and cover Wind That Grows where she lies, and keep her broken body warm and alive. Then he goes to her village, to her father for help. “The father is angry with Raven Caller for bringing this calamity upon his daughter. Also he reminds the younger man that, before he can even think of marrying Wind That Grows, there is unfinished business he must do. He is still in thrall to ‘the evil one’ – a witch who seems to be his mother (or step- or perhaps adoptive mother), a jealous tyrannical woman who wants to possess Raven Caller and not lose him to Wind That Grows. In a flashback, we learn how this jealous woman had possessed his soul and, by her magic, sapped his powers. He managed to escape her, but by a ruse she had lured him back to her, and changed him to an invisible shape of air. As he de-materialised, to preserve at least something of himself, he tore out a handful of his teeth and cast them to the mercy of the wind. Thus have they been brought to Wind That Grows, and now she has started the process that brings him to physical life again. Restored, he can muster the confidence to go freely to the witch, and confront her. In an act of positive recognition he virtually thanks her for having brought him up strong enough to do what he does now: he touches her gently, with compassion indeed, and ‘lets her go’ – thus frees himself from her destructive hold on him. The witch vanishes from the story. Five characters; several time-lapses (including a substantial flashback); a constantly changing physical location; scenes of magical conjuration that in performance are difficult to believe; and a process energised throughout by the transformative presence of birds. It is difficult to see how this narrative, as it is, could exist upon any space, let alone become a two-hander in a modest-budget production suitable for small-scale tour. Yet its underlying story-pattern is stark and simple: a woman and a man, compelled toward each other through a hostile world, and who in order to reach each other, must put entirely behind them the lives that they have lived before. And that was the narrative pattern that previously I had instinctively been shaping. It is to this two-character essence that the Native American story’s complex narrative mechanics would need to be distilled. The dramaturgical solution must be, to interiorise the other three figures: Healing Woman and the father, as potential positive energies in Wind That Grows; the ‘witch mother’ as a negative compulsion in Raven Caller, that he is allowing to control and disempower him. The dramatist’s task then is to condense the two central characters’ process into one single unbroken narrative curve, of continuing interaction upon the space. Each character’s past, her discontent, her quest, his ordeal and trauma, all the negative back-story that has brought them each here, must be compressed into their living present-tense emotions, in action here and now before us. And here we come close to what, as a librettist, I sense as my duty to the composer. It is a collaboration in the true sense of the word – a mutual working together over every detail, dramaturgical and verbal, of the dramatic text. (And later in our process, I will have dramaturgical points to make about aspects of the music too.) It is not a matter (as with some modern opera seems to have happened) of a writer providing a ‘book’ for a composer to ‘set’. Libretto is a key that unlocks the magical music-theatre we are together working to create. In fact, as a poetic dramatist, I dislike intensely the notion of my words being merely ‘set’. I know it’s the word that composers use, probably the only word available; but to me it suggests a sterile process, somewhat like pouring melody as a sauce over cold dead curves of phrase. It is for this reason that I have not licensed composers to turn any of my plays into opera. It is not because I am possessive; it is because, in spoken theatre as I practise it, language is the character’s prime mode of being, and any ‘setting’ will limit its resonance. In spoken poetic drama, the music is already in the words; the composer will only intervene. But in music-theatre, these values are reversed. When as a poetic dramatist I come to music-theatre, my words must not be ‘musical’; but they must be such as to generate music. As language, they must be quite plain and primary – simple too, for there is always the need for them to sound clearly when sung. The librettist must offer the composer a language that does not behave as poetry, but internalises its poetry to an energy compressed within. It must be a language that does not itself do the singing, but that has in it the potential to lift from the earth and sing. It is for the composer to hear within it, and release, the beating of its wings. Black Feather Rising has passed through as many reworkings, each itself much revised, as did our earlier work. But I hope that, as with that piece, tonight’s will seem to you as transparent and easily-done as if this one too had come naturally right first time. And in conclusion I must make one personal acknowledgment. Not only did I encounter my source-material in a collection of Native American stories published by the cultural anthropologist Teresa Pijoan; into the fabric of my libretto I wove elements also from other stories in her collection. It has proved one of the richer rewards of this collaboration, to make contact with her, in seeking her gracious permission to proceed, and through her good offices the blessing of the Eboli pueblo of New Mexico, whose story this originally is. She tells me that they are honoured that this ancient tale of theirs has gone out into the world to live a new life. I hope I do them justice.